Here's to a good first day! Ace is checking out the haul. He doesn't realize it but he's looking at whole wheat pasta with grouse sauce for dinner tomorrow night. Let's see- we marinate 5 grouse breasts overnight in a marinade made of olive oil, fresh garlic, fresh sage and other spices for 13 hours. Then cube, stir fry and add to favorite pasta sauce. My mouth is watering just thinking of it. This place is great again this year and the honey holes from last year are still producing. 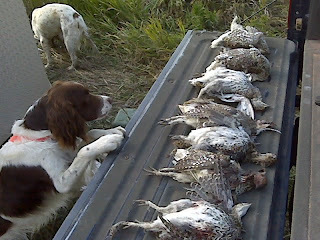 I look forward to working dogs and shooting birds here for a week.